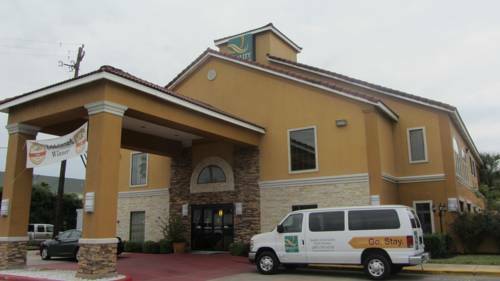 Get more for your money at the Quality Inn and Suites hotel in Houston, TX near Greenspoint Business District and George Bush Intercontinental Airport. Nearby destinations include Fort Sam Houston National Cemetery, Texas Medical Center, Toyota Center and Minute Maid Park. Enjoy amenities like free full breakfast, free WiFi, guest laundry facilities, fitness center, a 40-person meeting room and a business center with copy and fax services. Additional amenities include free airport transportation and our outdoor pool. Guest rooms include a flat-screen TV, refrigerator, microwave, hair dryer, iron and ironing board. Also, earn rewards including free nights and gift cards with our Choice Privileges Rewards program.